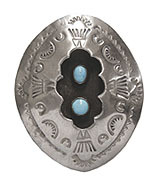 Item #SY-676320-2B: ESTATE PIECE - 48.5x57.5mm Sterling Silver Eagle Bolo Tie with Turquoise; Sterling Silver Bolo Tips on 38" Black Leather Cord; 39.63 grams TW. Item #SY-676322-13A: ESTATE PIECE - 48x54mm Sterling Silver Eagle Bolo Tie with Turquoise; Sterling Silver Bolo Tips on 38" Brown Leather Cord; 39.80 grams TW. Item #SID-9E-21B: ESTATE PIECE - 1 5/8" x 2 3/8" long Sterling Silver bolo with 20x39mm oval Turquoise cab and Sterling Silver bolo tips on 42" black leather cord. 28.43 grams TW. Item #SY-893598-8: ESTATE PIECE - .75" wide x 26.75" long Leather Hat Band with Sterling Silver Conchos; 40.94 grams TW. Item #SY-150-3J: ESTATE PIECE - 1 5/8" x 2 1/4" long Sterling Silver bolo with 4x9mm oval Turquoise cab and 5mm round Turquoise cab of 18.73 grams TW. Item #SY-676340-1T: ESTATE PIECE - 4.25" long Sterling Silver Baby Fork; 20.20 grams. Item #SY-676340-1X: ESTATE PIECE - 4.5" long Sterling Silver Baby Spoon; 22.09 grams. Item #SY-676322-9C: ESTATE PIECE - 42.5x52mm Sterling Silver Bolo Tie; Sterling Silver Bolo Tips on 38" Brown Leather Cord; 34.12 grams TW. Item #SY-676340-1Y: ESTATE PIECE - 4.25" long Sterling Silver Butter Knife; 11.02 grams. Item #SY-129-2: ESTATE PIECE - Set of six 2" tall Sterling Silver Salt & Pepper Shakers; 42.10 grams TW; shakers stand 2" tall. Item #SY-676340-1S: ESTATE PIECE - 4 3/8" long Sterling Silver Souvenir Spoon with engraved Church and "Catholic Church of Silver Creek, Nebraska"; 15.29 grams. Item #SY-676322-3B: ESTATE PIECE - 37x51.5mm Sterling Silver Walking Bear Bolo Tie; Sterling Silver Bolo Tips on 35" Black Leather Cord; 40.67 grams TW.